Pope Leo X was born Giovanni de Medici in 1475 and raised in Italy's most culturally sophisticated city, Florence, as part of the prestigious de' Medici family, renowned patrons of the arts, benefactors of scholarship, and masters of political intrigue. He became one of the most extravagant of all Popes, more a patron of the arts as his parents were than a significant ecclesiastical figure. He was a skilful administrator, and became Pope at the age of 37 in 1513. Immediately Leo demonstrated his appreciation of art by initiating a massive building project to beautify the Vatican. The pomp and extravagance of his court was an indirect cause of the Reformation because to acquire the enormous sums of money for renovation, he encouraged the sale of "Indulgences," which was a promise of relief from eternal penalties. In Germany this practice aroused the ire of Martin Luther, a humble monk, who issued ninety- five arguments for church reform. Luther wrote in his 95 Theses, his criticism of the Church - "why doesn't the Pope build the basilica of St Peter's out of his own money?". German nobles saw an opportunity to cut off currency flowing to Rome that was very much needed at home, so they backed Luther's cause. In 1520, Leo issued the papal bull Exsurge Domine demanding Luther retract 41 of his 95 theses, and after Luther's refusal, excommunicated him. Some historians believe that Leo never really took Luther's movement or his followers seriously, even until the time of his death in 1521. They also contend that if he had been more interested in religion than artwork, the Reformation may never have happened. 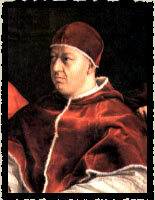 Pope Leo X was also the Patron of the artist Raphael and granted King Henry VIII of England the title 'Defender of the Faith'. He was the last pope to look at the papacy as a temporal monarchy.